April is a monumental month for Gears of War fans, this month we get our first taste of Gears of War 4. Beginning April 18, if you’ve played Gears of War: Ultimate Edition on Xbox One or Windows 10 you’ll have the opportunity to participate and help share the multiplayer experience of Gears of War 4 in an early access beta. Following the conclusion of the early access beta on April 24, all Xbox Live Gold members on Xbox One will get their opportunity until to play in the beta until May 1. However, this past weekend, I was able to get my first hands-on experience with the Gears of War 4 Versus Multiplayer beta. After 20 plus hours of multiplayer mayhem, I am more than impressed at what The Coalition has accomplished so far. 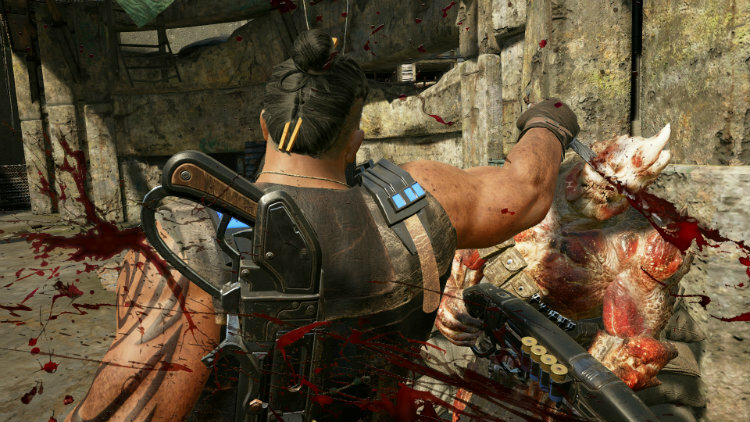 The Gears of War 4 Versus Multiplayer beta features three new maps: Harbour, Dam, and Foundation. In addition, there are two modes: the classic versus multiplayer Team Death Match, and a brand new mode called Dodgeball. 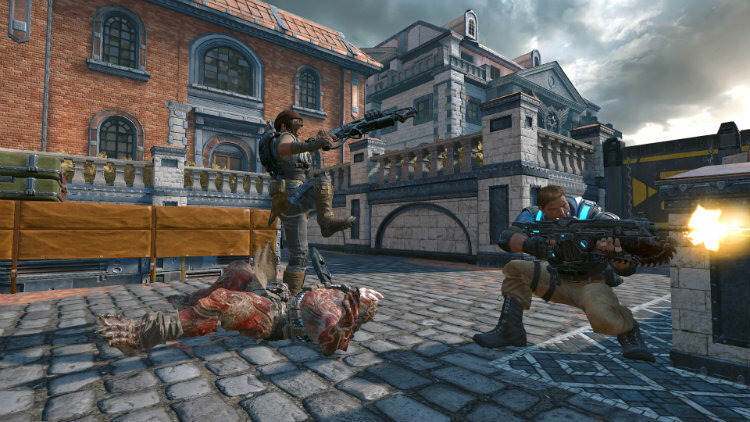 Team Death Match is a return to the gameplay style of Gears of War 3, with close range visceral combat and the introduction of two new moves—the vault kick and yank and shank. Remember the mantle kick from Gears of War 3? The vault kick is essentially a mantle kick with a running start. Giving you’re the ability to leap over cover without stopping, and kicking your opponent—leaving your opponent open for a brutal combat knife finishing move. On the other hand, yank and shank allows you to simply reach over cover and drag your enemy to you. It’s not going to be that easy though, both the vault kick and yank and shank can be countered. Precise planning along with critical timing is still needed to take your enemy off guard. Pitting two teams of five players against each other, Dodgeball mode mixes things up by allowing you to bring a dead teammate from your squad back into the game by taking out an opposing player. As a result, this can lead to some dramatic swings in matches as a lone survivor can theoretically bring their entire tame back from the sidelines. On several occasions in this mode, I was in the unpleasant position of being the last remaining member on my team. As I made my way around the map picking off enemy stragglers in guerilla gunfights, the pressure to bring my fallen teammates back was immense. Each kill saw a teammate return, and in a blink of eye I had swung the match back into my favour. What a rush! A beta wouldn’t be complete without a new weapon, and The Coalition delivers. The Dropshot is a particularly devastating weapon that is capable of drilling into your enemy’s skull and ripping their head off. In a nutshell, the Dropshot fires an aerial mine that floats over the battlefield in a straight line as long as you hold the trigger. The moment you let go, the mine begins a downward spiral, which if it hits the ground will drill for a few seconds before exploding—blowing up anything nearby into chunks. A few times, I was lucky enough to hit my enemy right on, the mine completely decapitated my opponent, and their body convulsed until the mine exploded. A truly “mind-blowing” experience to say the least! Take a look at The Coalition’s own Rod Fergusson demonstrating the Dropshot below. It’s hard to believe that it’s already been 10 years since the first Gears of War was released for the Xbox 360. Now a decade later and we are gearing up for the fourth installment in the series and I couldn’t be more excited. 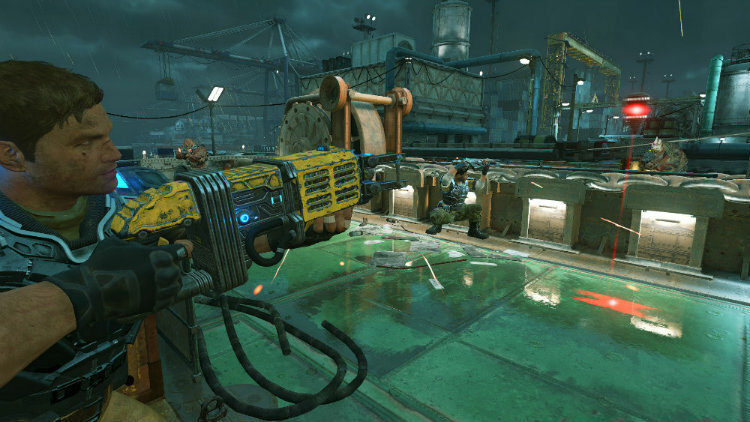 The Coalition has managed to create a game thus far that feels like a true Gears of War experience, while evolving the series at the same time. The three new maps are adequately sized, Dodgeball is simply addicting, the two new moves will give cowardly campers a considerably shorter life expectancy, and the Dropshot is a devastating weapon making for some particularly gruesome encounters. If the Gears of War 4 Versus Multiplayer beta is any indication of what The Coalition has in store for us come October 11—I’m in!